Things just keep getting better! 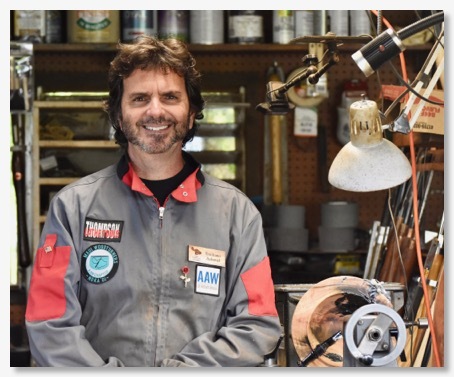 After approaching the editor of the best woodturning magazine in the world, Woodturning UK, I was offered a contract to become a contributing writer. After careful consideration, of about 2 minutes, I accepted. I'm now their latest writer! My intro-bio has been presented, and in the May issue I will be introducing myself to the world. The great Bill Jones was himself a writer for Woodturning for over 20 years, those are some very big shoes to fill! 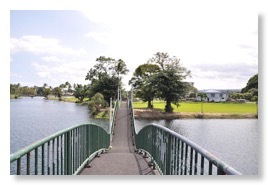 The picture above is of the Wailoa Arts Center , in Hilo, the Big Island of Hawaii. I wrote an article about the 19th annual woodturning show, and my demo, soon coming out in Woodturning UK!! I was awarded a scholarship by the American Association of Woodturners. I'm going to one of the best Arts Schools in the world, famous Arrowmont, in Gatlinburg Tennessee. I'll be taking a class with Irish turner Emmet Kane. More on that in my August Blog, when I'm back home..
We have Lyle Jamieson doing a Demo for us on April 15th, then we have Dixie Biggs coming to Maui on May 13 and 14th, and finally Marco Giuolongo will be here in June!! Lots of things are happening, the hand chased boxes are well received and selling almost as fast as I can make them. I have made lots of updates to the web site. More are coming, like with my turning its an always evolving site, I'm never done, always working, adding pictures and keeping it fresh. Till next time, Aloha. The Seabury Hall fair is the largest one in the state of Hawaii. Artists and crafters come from as far as Oahu to sell their art. 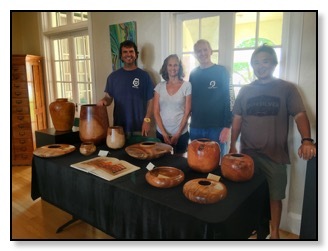 This year we decided to promote the Maui woodturners association, and go to the fair as a club. I was joined by Shaun Fleming, Vince Hogan and Wayne Omura. Shaun is the current first place winner at the Hawaii Forestry Wood show, where the most talented woodworkers in Hawaii display their art once a year. Vince is the Vice President of the club and one of Hawaii's most talented woodturners. He specializes in custom made Hawaiian Calabashes, his signature work are the really big umekes. 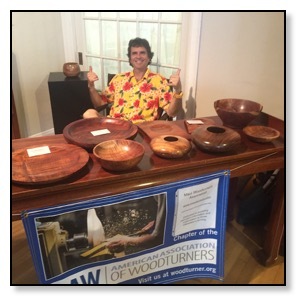 And last, Master woodturner Wayne Omura, our club Treasurer, famous for his big translucent Island Norfolk Pine bowls. Wayne was the most succesfull seller of the our group at the fair! That's me! Yous truly, Emiliano Achaval at the fair…. It seems like yesterday when I got my first lathe… With the help of some friends I was able to make the move in just a few days. My "new" location is the old 3 car detached garage at my house… I love it. Its great to be able to work, almost out of the house. This monday , April 18th, we are hosting Andi Cole, President of the Honolulu Woodturners Association. Andi will be showing us how to core a bowl with the McNaughton coring System. Since we founded our woodturners club, in february of 2016, I have had so far, 7 mainland visitors to my studio. The AAW has a list of all members and clubs on their resources page. It's always fun to meet new people, specially if they are fellow woodturners!! 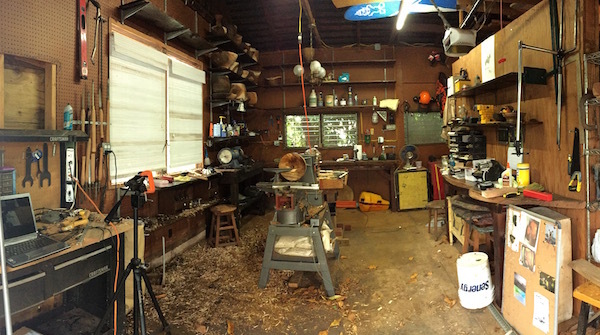 A new chapter has started in my life, as President of the Maui Woodturners Association… A great group of people have joined, 23 members so far!! We have montlhy meetings, we exchange ideas, learn new things, have a wood raffle, and the main thing, we have a lot of fun!!! Each pice that comes off my lathe is a labour of love. I'm my worst critic, If I'm not completly satisfied, the piece will not be for sale, or given to the customer that order it. Till next time, Aloha, safe turning and make lots of chips.